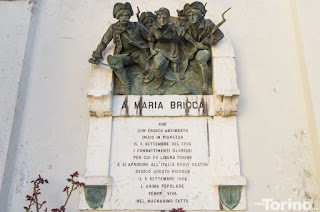 The unlikely war hero Maria Bricca, whose actions would precipitate a major victory for the Duchy of Savoy in the War of the Spanish Succession, was born on this day in 1684 in Pianezza, then a village about 12km (7 miles) northwest of the city of Turin. 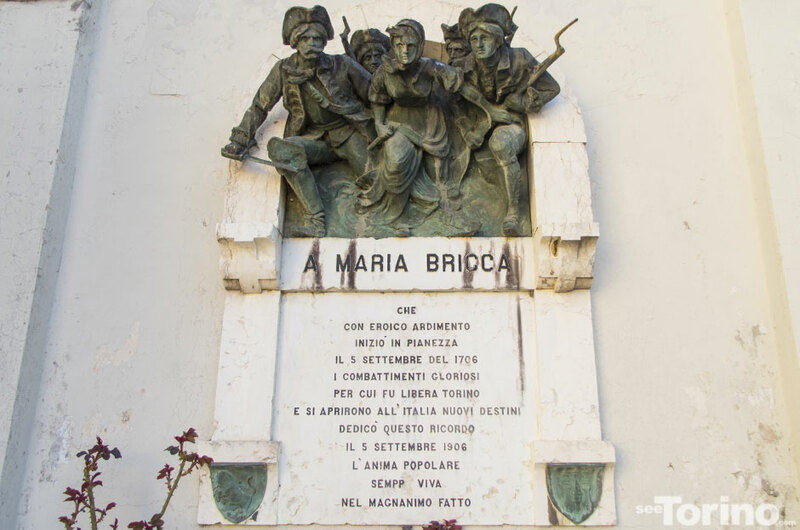 Maria, who was born Maria Chiaberge but changed her name after she married Valentino Bricco in 1705, became an important figure in the ending of the four-month siege of Turin by the French in 1706. She hated the French, who had sacked Pianezza in 1693 when she was just eight years hold, killing villagers and looting property before her eyes. In 1706. when they took control of the castle at Pianezza, which occupied a strategic position overlooking the Dora Riparia river, it brought back memories of the scenes she had witnessed as a child. The castle had been changed in character to a noble residence rather than a military fort but was a natural stronghold nonetheless. The French stocked it with supplies for the 44,000 soldiers who were occupied in the siege of Turin, then enclosed by fortified walls and defended by a garrison of around 12,000 Savoy troops. When Maria, who was nicknamed La Bricassa, heard that Prince Eugene of Savoy had dispatched a force of 9,000 Prussian soldiers led by his ally, Prince Leopold of Anhalt-Dessau, to try to take control of the castle, she knew she had information that could help them. As a cook, she had previously worked at the castle and knew of the existence of a secret underground passage that led from the village - possibly from her own house - directly into the castle. 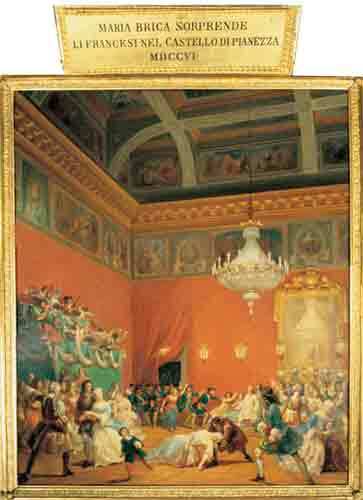 She brought this to the attention of the Prussian prince and, on the night of September 5, 1706, while the Marquis Visconti was launching an attack on the castle from the outside, Maria led the soldiers along the underground passage until they reached a secret door that opened directly into the main dance hall of the castle, where French officers were said to be celebrating what they considered to be an imminent victory in the siege of the great city. Some accounts have suggested Maria was the first to break through the door, wielding an axe and shouting “Viva i savoia!” (Long live the Savoys! ), although this is disputed. Inside, the French were taken completely by surprise. Some even wondered whether this sudden incursion was part of the evening’s entertainment until the invaders began killing French soldiers. The operation was a huge success, resulting in the capture of two colonels, two generals and a loot of cannons, 600 horses and two million francs. There were 200 mules loaded with provisions for the besiegers stationed around Turin, and 50 mules laden with Champagne for the Duke D'Orleans. What’s more, in the hours that followed, the Savoy-Prussian soldiers were able to attack the French army and within two days the siege of Turin was over. Maria Bricca died in relative obscurity at the age of 49 but the story of her contribution to the defeat of the French was revived in the 19th century when an account came to light, written by an anonymous French observer, which noted the role of the former castle employee in helping the Savoy army launch their surprise assault. 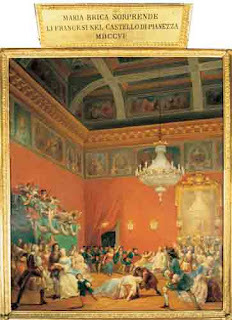 As a result, her memory was immortalised in a painting by the artist Francesco Gonin which hung originally in the Sala del Caffè in Palazzo Reale in Turin, and which can be found now in the royal apartments at the Basilica of Superga outside Turin, which shows Maria Bricca wielding an axe. There is a nearby monument featuring her image, installed in 1906 on the bicentenary of the victory. La Superga was constructed by the Savoy king Vittorio Amedeo II as thanks to the Virgin Mary for the defeat of the French. 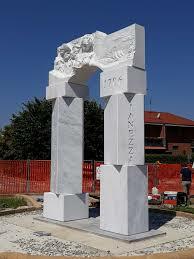 More recently, a modern monument - sculpted by Gabriele Garbolino Ru - in the town of Pianezza. The tunnel has been renamed Galleria Maria Bricca and is occasionally open to the public. 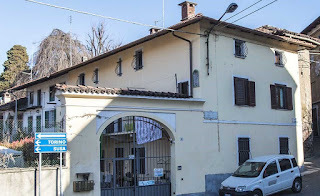 In Turin there are a number of streets that carry her name, as well as a retirement home, and there is a plaque marking her house in Pianezza. Her story captured the imagination of filmmakers. 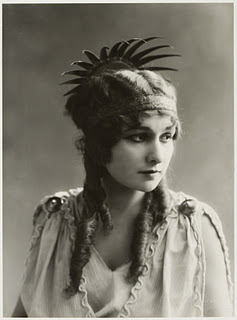 In 1910, the silent film 'Maria Bricca: the heroine of Piedmont' directed by Edoardo Bencivenga and starring the then-famous actress Lidia Quaranta as Maria, was released in cinemas. More recently, in 2011, her story was the subject of a short film, Pianezza 1706 - Maria Bricca. Pianezza today is a town of just over 15,000 inhabitants on the outskirts of Turin in Piedmont. It is located just beyond what would have been the western gates of Turin, along the banks of the Dora Riparia river. The area grew in population at the end of the 17th century with the development of silk and textile industries, and again in the 20th century when factories began to locate in the area, including the Leone Pastiglie confectionery company. Only a few remains of the castle exist, in the grounds of the Villa Lascaris, which was built on its site early in the 19th century. The most impressive building in the town is the neo-Gothic Sanctuary of San Pancrazio, originally built between 1647 and 1657 and rebuilt substantially in the 20th century. 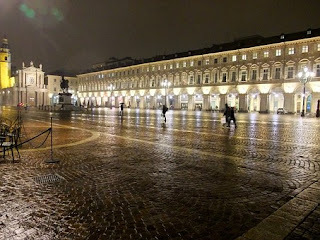 The city of Turin, once the capital of Italy and traditionally seat of the Savoy dynasty, is best known for its royal palaces but tends to be overlooked by visitors to Italy, especially new ones, who flock first to Rome, Florence, Venice and Milan. Yet as an elegant, stylish and sophisticated city, Turin has much to commend it, from its many historic cafés to 12 miles of arcaded streets and some of the finest restaurants in Piedmont. 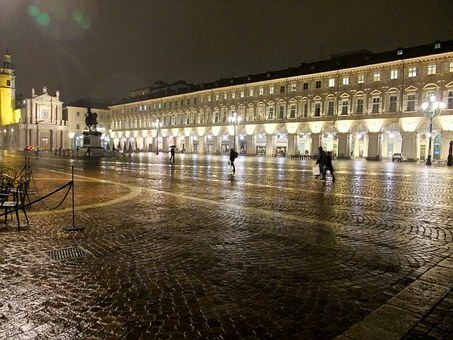 To enjoy Turin’s café culture, head for Via Po, Turin’s famous promenade linking Piazza Vittorio Veneto with Piazza Castello, or nearby Piazza San Carlo, one of the city’s main squares. In the 19th century, these cafès were popular with writers, artists, philosophers, musicians and politicians among others, who would meet to discuss the affairs of the day.